KIEV, Ukraine -- New photos of Ukrainian special operations forces show a steady increase in Western influence. With elite forces already a critical part of the fight against Russian-backed separatists in the country’s eastern Donbass region, officials in Kiev have no doubt been keen to take any lessons, even indirectly, from their counterparts in the United States and Europe. One June 8, 2017, Ukraine’s Ministry of Defense posted a number of undated images of special operators or candidates during training. The pictures showed troops maneuvering through temperate, snowy, urban, and nighttime environments, as well as conducting apparent team-building type exercises. More importantly, their weapons and gear are very similar to the kit that American and Western European special operations forces commonly employ. After the breakup of the Soviet Union, the newly independent Ukraine inherited a significant number of existing military units, along with associated military infrastructure, weapons, and other equipment. These included both military spetnaz – a contraction of the Russian words spetsialnogo naznacheniya, meaning “special purpose,” which has become a catch-all term in Russia and many post-Soviet states for elite formations – and other specialized personnel within the Ministry of the Interior. So it’s perhaps not surprising that the bulk of the weapons on display were derivatives of Soviet-era designs, including members of the legendary Kalashnikov rifle family and the ubiquitous PKM light machine gun. At least one of the operators has a much more uncommon Stechkin APS pistol with a sound suppressor. This handgun fires the same 9x18mm cartridge as the Makarov pistol, but has the ability to fire fully automatic at a rate of 750 rounds per minute. In this mode, a shooter could burn through a full 20-round magazine in a matter of a couple seconds. The 9x18mm round is notably less powerful than NATO-standard 9x19mm ammunition. Ukrainian companies, such as RPC Fort, still produce many of these weapons, as well as updated versions, as well as the ammunition to go along with them. However, the Ukrainian special operators have versions of these old standbys covered in accessory rails and fitted with various red dot optical sights. One spetnaz troop has a combination of an EOTech Holosight and a magnifier. This allows the operator to switch rapidly between sights better suited for close-in and longer range engagements. In May 2017, Military Times spotted a fighter with an elite element of the Kurdish People’s Protection Units rebel group, better known as the YPG, carrying a similar configuration in Syria, which it said was indicative of American support for the unit. A separate video showed Ukrainian elite troops have been using the configuration for more than a year. Fort has also begun license producing a number of Israeli-designed weapons, including a number of versions of the Israeli Weapons Industries Tavor TAR-21 bullpup rifle. Ukrainian special operators appear in one of the pictures carrying a short-barrel version of this 5.56mm weapon, which would be ideal for urban operations or when rapidly moving in and out of a vehicle or helicopter. In addition, snipers are seen with sniper rifles featuring rail accessory hand guards and lightweight, modular stocks similar to the U.S. Army’s M2010 or U.S. Special Operations Command’s Mk 21 Mod 0 Precision Sniper Rifle. As early as 2013, Ukraine's PJSC Mayak Plant, under direction from the state-run arms enterprise Ukroboronprom, had already begun designing precision weapons in the NATO-standard 7.62x51mm cartridge, as well as .338 Lapua Magnum, a round popular among Western military forces. On top of that, most of the elite forces in the pictures are dressed in the uniforms with a camouflage scheme similar to the U.S. military’s Operational Camouflage Pattern (OCP) or the commercial Multicam design, both of which have long been popular among American special operators. Some wear lightweight Ops-Core helmets, which were also cited in Military Times’ May 2017 report from Syria. One image shows two spetnaz, including one with a PKM machine gun, driving a small all-terrain buggy similar in size and shape to the Polaris MRZR that U.S. special operations forces and other specialized units have in service. In May 2016, these vehicles appeared with elite American troops in Iraq, too. To be fair, Russia’s own spetnaz have been adopting a lot of similar kit since the end of the Cold War. 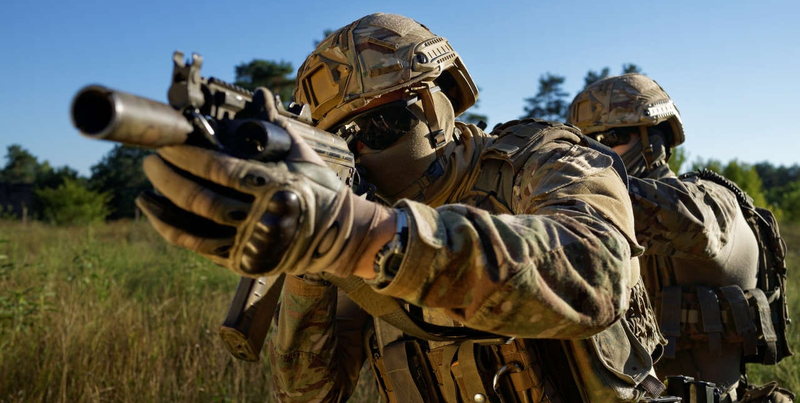 However, the exact types of gear Ukrainian special operations forces are using, and even the brands in question, highlight increased interactions with their American counterparts and possible active shared training sessions. It’s worth noting that in April 2016 Ukrainian Major General Ihor Lunyov, head of the country’s Special Operations Forces Command (SOFCOM), and his staff traveled to Stuttgart, Germany to meet with U.S. Air Force Major General Gregory Lengyel, then in charge of Special Operations Command Europe (SOCEUR). Two months later, Lengyel left to take up the post of Deputy Commanding General of the secretive Joint Special Operations Command. “The visit consisted of briefings and discussions at the SOCEUR Headquarters on the current state of Ukrainian Special Operations Forces (SOF), the U.S. and partner nation SOF contributions to the Joint Multinational Training Group-Ukraine mission, along with a conversation on the future structure and the development of the Ukrainian SOCOM's institutional capacities,” according to an official press release. Ukrainian officials have been eager to expand the ranks of their elite units since Russia seized control of the Crimea region in March 2014 and then began actively supporting separatist factions elsewhere in the country. The spetnaz community, both in the Ministry of Defense and the Ministry of the Interior, had already been deeply entangled in the country’s many crises. The Ministry of Interior’s Berkut special purpose force was heavily implicated in the violent crackdown that led to Ukraine’s 2014 revolution, which in turn unseated pro-Russian President Viktor Yanukovych and touched off a series of events lead to the country’s civil war. In the aftermath, the new Ukrainian government disbanded Berkut. Other spetnaz units, which were among the best trained and equipped, were also entangled in the country’s political upheaval, with some members reportedly defecting to Russia or joining Russian-backed militia in the Crimea and Donbass regions. Those that remained loyal to officials in Kiev were quickly deployed to combat separatists who had established de facto statelets in the country’s Donetsk and Luhansk Oblasts. During the fighting in and around Donetsk Airport in 2015, Kremlin-supported forces dubbed the Ukrainian defenders, which included members of the 3rd Spetnaz Regiment, as inhuman “cyborgs” for their tenacity. They only abandoned their positions after repeated artillery bombardments and assaults with tanks and other armored vehicles. Unfortunately, though supportive of the government in Kiev and its claims to territorial integrity, the United States has gone back and forth on just how active its support should be and whether military assistance should include the sale of offensive weapons like artillery pieces and anti-tank missiles. So far, the only publicly announced SOCEUR engagement in Ukraine involved medical training. Given that they remain at the forefront of the country’s internal security campaign, Ukraine’s spetnaz contingents would want to seek out top of the line weapons and gear in general. But the new images suggest ties with Western elite units may be expanding, either directly or indirectly.